I just finished up block 6 of the 182 day solstice quilt challenge. Even though I like having this to look forward to each Wednesday, once the block for the week is finished, I sometimes wish I could move on to the next block. For me, that's the down side of a quilt-along. Isn't there a song that goes "the waiting is the hardest part" ? ha-ha! So I will have to move on to something else. I have a few "something elses" that I could work on. I have one quilt top and backing done that needs to be sandwiched and machine quilted. I have two other quilt tops done. Both need backing before getting them ready for quilting. 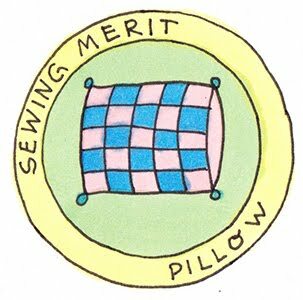 I have one quilt that I finished quilting and I sewed the binding on, I just need to hand-stitch the binding to the back. And that's it! Those are all my unfinished projects. It almost seems unreal that there are no other WIPs. Oh wait... I forgot about those two quilt tops that need applique. I think I forgot about those on purpose. I guess I better get to work. As part of my new year's resolution, I want to participate in Pat Sloan's Winter Solstice quilt along. 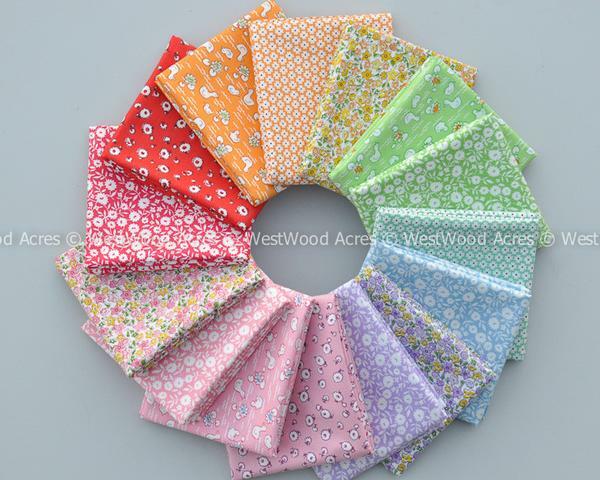 I've had this cute little bundle of fabric I purchased from Westwood Acres last year called Storybook Vacation. The fabrics have small prints in soft colors. They've been sitting on the top shelf of my fabric closet and every time I open the closet, I see the pretty colors and wish I had a plan for them. Yesterday I decided to use them in the quilt along. It just makes fabric choices so less stressful when I just have to grab a bundle instead of going through the process of matching up colors and fabric designs myself. I do think fabric selection is fun, but sometimes this is just easier. The quilt along is on week #5. So I had some catching up to do. I did make 3 of the 5 blocks available by the end of the day yesterday. Today I made the other two so I am now all caught up. So far I like the results and I can't wait until next Wednesday to get the next block instructions. I finished sewing the binding on my Valentine heart quilt today. I followed Jenny Doan's YouTube video instructions to make the blocks. The problem I have with MSQC's videos is that some of the instruction are vague. For example, with this quilt Jenny says she just adds sashing and a border then she mentoned how much yardage needed to complete the quilt top. The instructions never state the width of the sashing strips or border. So I just decided to do what I thought was best. The heart blocks ended up measuring 9 1/4" x 9 1/4". I decided to add 3" sashing around the blocks. I decided to cut a 1-inch strip of black fabric as an inner border. Then I made the outer borders 3 and a half-inches wide. 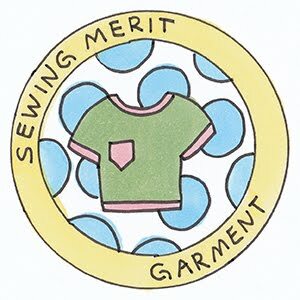 I do love the YouTube videos and I appreciate that they are free so I am not really complaining, after all, it's really not that hard to figure out the size of sashing. The way I figure it, if I don't like the size of the sashing I can always change it. I made this second version of the Pyramid Bag. After my first (upside-down) attempt, I just had to do one right. So I dug up some scraps and a matching zipper, and there we have it - a pyramid pouch where the fabric direction doesn't really matter so on that note, I guess I couldn't get it wrong this time even if I tried. During the class I attended, we were supposed to make two versions of the pyramid bag; a larger one that's 12 inches wide and a smaller one that's 6 inches wide. I didn't get far enough along within the class time to finish the second bag. I had it cut out and interface applied but that was all. 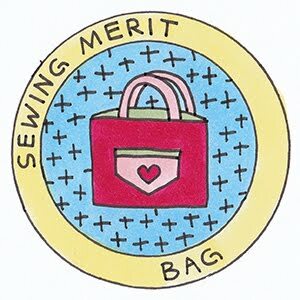 Since I finished a new version of the larger bag, I thought I should finish the smaller one as well. Since there's no scale to these photos it is hard to tell but the smaller pouch is so very cute. I think I will definitely be making many more of these little ones. I absolutely love it. I have many spools of rick-rack and ribbons that have become out of control. I have them stashed on my shelves, in bins and in baskets. It's time to consolidate these things and get them all in one place. I knew exactly what to do...get out my Sunday Morning Quilts book! There's instructions in the book for a nice fabric basket. It's quick and easy, although as almost always, I made some changes. I cut out pieces from batting and did a quilt-as-you-go thing on the sides and bottom of the basket. I chose not to put interfacing in the lining, I just left the cotton fabric as is. It went together quickly, the most time spent was in using some of my machine's fancy stitches on the qayg basket sides. I am so happy to discover that I have more ribbon spools than I thought. It's nice to have them all in one place. I finished the Shoo-Fly quilt late Sunday afternoon while watching our Packers beat the Giants in the playoff game. Sewing the binding on this quilt was a nice distraction when things weren't going well for our team which wasn't very often since they played well and won by a comfortable margin. Considering I started this quilt in September and worked through some issues with picking out lots of quilting as I realized I hated the original backing I chose, I don't think this took all that long. 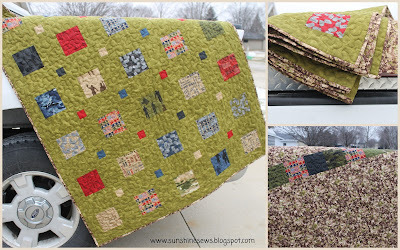 I did set it down during the Thanksgiving and Christmas holidays while I contemplated what I would do about the ugly backing I originally chose so the time actually spent on the quilt wasn't all that bad. Using the leftover layer cake squares from the chosen fabrics with some yardage I got on sale made a great deal of difference in how the back turned out. Lesson learned: if it's an iffy choice - stop and rethink it. Yesterday was an overcast day so it was perfect for taking photos of the quilt. Although it was a little windy, I did not have to hold it down. The only awkwardness came from its bulk; the quilt measures 84" x 104". I am very happy with the end results and I just might enter this one in a quilt show. I've had the tutorial for a cute mini notions bag on one of my Pinterest boards for quite a while and today I thought I would give it a whirl. As part of my new year's resolution to try new things, this would qualify. The tutorial used 4-inch zippers and I have a bunch of them leftover from another craft project. I buy all my zippers from ZipIt - an Etsy store that I love. The zippers are reasonable and the more you buy the cheaper they get so of course I bought way more than I needed. So I decided to try this tutorial and the largest piece to cut was 5 inches by 4 and a quarter inches. That meant using up scraps. This may seem like a funny way to use up scraps but basically what I did was take out my 4-inch zippers and match the colors of the zippers to the scraps I had. I came up with many great combinations. To make this project even better, while I was digging through my scrap bin, I found some leftover pieces of clear vinyl from an I-Spy project I did with some of my coworkers for an Alzheimer's awareness event. We made I-Spy bags for patients in nursing homes. It was a lot of fun and rewarding. I cut the pieces out and made a few changes to the original tutorial from Simply Notable that can be found here. First of all, the original project used laminated fabric and I used quilting cotton. That meant I had a little more fraying to deal with so I zigzagged the edges after I sewed around the edges. Secondly, I butted a piece of lining fabric up against the backing fabric so there would be a liner inside the back of the little bag. That way when you peeked in the vinyl window, you would see the lining instead of the back side of the backing. Third, I didn't use a Teflon foot. It wasn't really necessary as long as I put my cotton fabric on top of the vinyl, there was no problem with sticking while sewing. And that's about it. Aren't they cute? My daughter gave me an Etsy gift certificate for Christmas and it took me 4 whole days before I spent it! I also had some money in my PayPal account since I sold my Tutto case. I think the $$ were burning a hole in my pocket. There are three fabric shops on Etsy that I call my favorite(s). They are all wonderful and unique and I hope they are all around for a very long time. Normally I'm not very spontaneous when purchasing fabric but my husband was in the hospital having a 5 to 6 hour cardiac procedure and while sitting in the waiting room, I made the purchase. Long waits in hospitals make me do crazy things. This was sort of crazy. 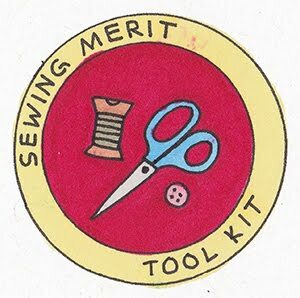 I didn't need any fabric and after cleaning up my sewing room earlier this week, I was feeling even more guilty for being so impetuous. As always, there's some Sweetwater fabric in my purchase. I'm not sure what I will use it for, but I can guarantee, it will be used. What fun to add to my stash! Happiness is . . . new fabric. As I picked all the quilting out of my fall quilt to remove the backing that I decided didn't go with the quilt, I knew where I wanted to use that fabric even before I removed all the stitches. I used a Marble Mates dark green and in small patchwork, that fabric went well in the fall quilt but in a large piece on the back it almost had a camo look. I thought I could soften it through quilting, but it just looked worse so I picked and picked until all the quilting was removed. Luckily I only quilted a quarter of the quilt before I knew it had to go! At a Christmas gift swap with my Quilts for Kids chapter, I received a Home of the Brave charm pack and some yardage. I knew that Marble Mates dark green was a much better match with this military-themed fabric collection than the fall quilt. I even knew of a perfect pattern to use to make a quilt top! 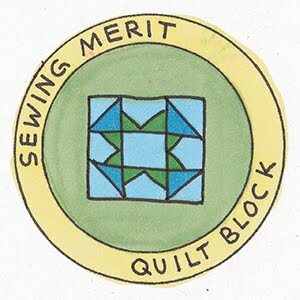 The current issue of Missouri Star Quilt Company's Block magazine contained the pattern. It's called Floating Squares and uses a charm pack plus some yardage for the background. It is a modern quilt and has lots of negative space and the camo-look of the Marble Mates would fit the bill. I ironed the large piece of Marble Mates to remove all the evidence that I picked out quilting from the fabric. Amazingly, it looked like new. Good thing I am very careful at unsewing. The instructions in the magazine are straightforward and the simple piecing made this go together very quickly. I cut and sewed the entire quilt top in less than a day. I was so happy to use up the charm pack, yardage and Marble Mates. The first day of each month I try to update my progress on this blog. I am happy to look back and see that each month the projects on the design board do change although not always as quickly as I would like. Sometime my motivation just doesn't keep up with my desire. Today I am definitely motivated and have the desire but since it is the first of the new year, I am much more motivated to start fresh. To that end I've spent the day cleaning up my sewing room. I really let things go over the past few months to the point where I don't remember where I set things down. I hate that. And I have to walk over piles of fabrics that I haven't put away. This clean-up is very long overdue. So today I took all the piles of all the stuff that is laying around and not put away and I piled it up on my sewing table. It was a horrible mess! I took my time and organized and rearranged a few things. I dusted and vacuumed and cleaned everything. I even used a lint roller on my design board to get all the schnibbles off. Yes, the design board hangs empty right now! It took all day. But that's OK. I am all caught up on my client projects and have nothing pending that needs completion (except for my fall quilt but that's a big, big project). I can now think about what I want to do next. Truthfully, I have been thinking about what's next for a while and my goals for this year include projects from Lori Holt's books, from Judy Gauthier's book and a Missouri Star magazine project or two. I also want to complete some smaller projects besides quilts that have been on my to-do list for a long time. And just look, my sewing table contains nothing but the quilt projects I want to work on! It feels good to start fresh.